The 1970s Global Cooling Scare (and how the warming scare could not have happened without it) | Watts Up With That? This is the second post drawing on themes raised in the book Searching for the Catastrophe Signal. See a previous post on WUWT here. Forty-five years ago today, two geologists penned a letter to the president of the United States warning that the rocky decent into the next ice age might have already begun. …a global deterioration of climate, by order of magnitude larger than any hitherto experienced by civilized mankind is a very real possibility and indeed may be due very soon. When geologists say ‘very soon’ it is wise to hesitate, but Kukla and Matthews were quick to remove any suggestion that they might be talking only in terms of millennia-metered geological time. ‘The present cooling now underway in the Northern Hemisphere’, they went on to explain, ‘could be the start of this expected shift’. In other words, it looked every bit like the stable mild climate of recent millennia has already ended. It is hard to find a single document more instrumental in the history of post-War climate anxieties than this letter. It would trigger a series of events that resulted in the first coordinated program of climate research in the United States and then at the United Nations. It also set the stage upon which the global warming scare would subsequently be launched with demands for a global response. Today, as the 1970s global cooling scare starts to pass beyond living memory, it is widely misunderstood. This is especially in its relationship with the subsequent scare over global warming. Warming skeptics will often talk up the scare, emphasizing how meteorologists have flipped from cooling alarm to warming alarm. In fact, few meteorologists were involved in the cooling scare, while there were very few scientists of any variety who raised alarm over cooling and then switching to alarm over warming. On the other side of the current debate, warming alarmists often play down the cooling scare as little more than a press beat up (e.g., see here). This is also wrong. In fact the cooling scare was promoted by scientists on scientific evidence. Sure, the press did their usual job of playing up fears, but there was often a measure of circumspection thrown in. From the scientific point of view, the main problem with the press coverage was that meteorological speculation on the return of the Little Ice Age was confused with geologists’ warnings about a return of the bigone. The time has come to clear up the confusion and give the cooling scare its proper place in history. The summary that follows starts with thematic introductions to the context in which the cooling scare arose. It finishes by showing how the cooling scare set the stage for an easy transition to a warming scare. For a fuller account, complete with references, see the early chapters of Searching for the Catastrophe Signal. Meteorologists warned of a return to the Little Ice Age. By 1961 there was general agreement among historical climatologists that the 20th century warming trend across northern mid-latitudes had ended around 1940. A series of severe winters in the early 1960s raised concerns that a cooling trend was again settling in across Europe. This led some to warn that Europe may be returning to the prevailing weather patterns of the Little Ice Age, which had had a variable impact across Europe during the previous four centuries. In 1972 climate change broke into the public discourse as it never had before. On top of evidence for a cooling trend came not only a strong El Niño but also other weather extremes that are not directly associated with that phenomenon. The extremes were as much to do with precipitation as temperature. Some regions experiencing extraordinary flooding rains while the effects of a third year of drought south of the Sahara was soon broadcast with all its horror into living rooms across the wealthy north. There had always been talk that forest clearing and over-grazing caused or exacerbated local droughts, but, during the 1970s, droughts and all sorts of other weather extremes would be linked to the speculation about a natural global climate shift in the direction of cooling. From the late 1960s, the geology-trained US climatologist Reid Bryson was warning of the cooling effect of dust continually thrown up into the troposphere by human industry, especially agriculture. This and other mechanisms of human influence on global cooling did garner some interest, but throughout the 1970s the overwhelming concern with global climatic changes remained with changes that were entirely natural. From the late 1960s, concerns about the post-War population explosion involved concerns about the ability to produce enough food to feed everyone. The associated exponential increases in demand for non-renewable natural resources led to concerns about the absolute depletion of these resources, especially energy resources. In 1973, the Arab oil embargo targeted the USA and some of its allies, triggering the US ‘energy crisis’, which continued through to the end of the 1970s as a mostly socially constructed phenomenon, but real all the same. Meanwhile, a series of extreme winters in North America saw concerns over climatic change reinforce energy supply anxieties, especially when heating oil was in short supply. All these factors contributed to a prevailing public anxiety over food and energy security that was seen to be exacerbated by a cooling trend in the climate. We should note here that the US energy crisis peaked in 1979 before a subsequent crash. This is important because it coincided with a transition from cooling to warming alarm. The year 1979 brought the Iranian Revolution, which caused the oil price to quadruple again. It also brought the Three Mile Island nuclear accident which presented a turning point for the nuclear power industry. It is true that the 1960s expansion of nuclear electricity production had already started to falter around the time of the oil embargo due to cost blowouts and construction delays. However, an overwhelming response to the 1979 reactor emergency in Pennsylvania brought public safety concerns to such heights that the anti-nukes movement started to look like it was winning. And still in 1979 we find climatologists continued to report a cooling trend evident in the record. But then it was all over. Energy-climate anxiety rapidly dissipated after Jimmy Carter failed to win a second term, after the oil prices fell and after the climate started to show signs that four decades of cooling might be over. In man’s quest to utilize global resources, and to produce an adequate supply of food, global climatic change constitutes a first order environmental hazard which must be thoroughly understood well in advance of the first global indications of deteriorating climate. Later in the year this statement was published in Science, and then the organizers of the conference Kukla and Matthews sent their letter to the White House. During the 1960s, in the USA and internationally, atmospheric scientists had been lobbying for funding for coordinated climatic research. In the late 1960s the Global Atmospheric Research Program (GARP) was established to coordinate atmospheric research using new technologies especially satellites. While its mandate included climatic research, in fact the emphasis was placed much more on understanding and predicting weather, and so science administrators continued to lobby for a research program specifically targeting climate. One of these was the founding director of NOAA Robert White, who chaired the panel on ‘The Present Interglacial’ that was established ad hoc in response to the geologists’ letter to the president. This panel’s report was released in 1974 as no less than a proposal for a National Climate Program. From this time we can see a general push for general geo-physical research (atmospheric and oceanic) leveraging the concerns abroad about the food/energy/climate future. By 1979 this push had achieve significant success after a National Climate Act passed late in 1978. Although the funding remained modest, important bureaucratic infrastructure was put in place, including a National Climate Program Office (under NOAA) and an inter-agency National Climate Program Policy Board. Not long after it was established, the prevailing concern at the Policy Board switched from cooling to warming. It was at this Board in 1986 that another fateful letter, this time from the Executive Director of the UN Environment Programme, would be addressed. Mustafa Tolba’s letter (to Secretary of State Schultz) was attached to the report of the 1985 Villach Carbon Dioxide Conference, which had achieved a ‘scientific consensus’ declaring that it was time to move towards developing a policy response to the warming threat. Following debate at this climate policy board (and elsewhere in the US government) it was eventually decided that a further assessment was required by an intergovernmental panel, that is, by what would be the Intergovernmental Panel on Climate Change (IPCC). At the same time that steps were taken to implement their own national climatic program, the US also lobbied the United Nations and its World Meteorological Organization (WMO) for a world climate program. The formal origins of this lobbying can be found in a speech by Henry Kissinger to the UN General Assembly in April 1974. In that speech, Kissinger called on the world community to come together to solve common problems. He specifically mentioned that science should be used to solve problems that science helped to create. To his list of examples he added one threat that was not cause by science but that was entirely ‘natural’. This was the threat of climatic changes and it had implications for global food and population policy. Through Kissinger’s speech the USA proposed that the WMO (and the ICSU) ‘urgently investigate this problem and offer guidelines for immediate international action’. In the 1970s Robert White was also the head of the US delegation to the WMO. This meant that during 1974 not only was he coordinating efforts to get going a National Climate Program in the USA, but at the same time he was following up on Kissinger’s request at the WMO in Geneva. When White formally approached the WMO with the US proposal, the WMO was all but ignoring the global cooling scare. However, in response to the USA request it acted quickly to establish an Expert Panel on Climatic Change. Thus began a series of events that led to the WMO headlining the climate issue. What follows is a brief outline. In 1976 the WMO Expert Panel on Climatic Change released an ‘authoritative statement’ that downplayed concerns about a long-term trend towards cooling to instead emphasize short term fluctuations, including those that might be due to manmade effects. This panel then set about organizing the first World Climate Conference to launch the World Climate Program. At the 1979 World Climate Conference, much concern was raised about the carbon dioxide warming threat and the conference statement included an appeal to all nations that they ‘foresee and prevent’ manmade climate change. However, those in charge of the research component of the World Climate Program refused to address directly the carbon dioxide issue. The WMO Executive Council supported this position each time it was brought to their attention. The WMO’s reluctance to directly address the issue led Tolba at UN Environment Programme to take matters into his own hands. In 1983 he commissioned the first international study specifically addressing the issue (SCOPE 29). At its completion he called the famous meeting at Villach in 1985, where the climate treaty push began. The promotion of the ‘scientific consensus’ achieved at Villach, by Tolba and others, generated much discussion internationally. Importantly, it was taken seriously by the US Climate Policy Board and the US Department of State, where there was much debate about how to respond. When the matter was raised at the 1987 World Meteorological Congress, the US position was to call for another assessment of the problem by an intergovernmental panel. There was broad agreement with this view and so the IPCC was born. December 5, 2017 in Global cooling. Good review. It also reinforces my memory of Nixon as someone who could be trusted to consistently do the wrong thing. I stood next to President Richard Nixon on the Sabre Heliport runway, at DiAn, Vietnam, in 1969. I have waited 6 hours to write anything and will refrain from any other comments about my President, Richard Nixon. The history shows why you need to divorce science from politics, it is the same as judiciary and politics. Australia may actually finally going to tighten it’s law on political donations and influence which was announced today, any spending over $100K on poltical activism triggers the law. If the bill get thru as is groups like GreenPeace and Getup would all be deemed to be political organizations. Greenpeace has charity status and donations are tax deductible that would cease (New Zealand already treats GreenPeace as such). Getup does not have tax deduction status. Possibly organizations like OxFam and other NGO’s may fall foul of the scheme, most have not had time to give a position yet. The changes seem fair and reasonable and will bring left and green groups under the same rules as companies and individuals who seek to gain political outcomes. It will be interesting to see if Labour will try to scuttle the changes as it probably brings Trade Unions under scrutiny. Also “millennium” for”millennia”. Singular, not plural. Something I was looking for, but didn’t see, was Maurice Strong’s involvement in this and the establishment of the IPCC which he is widely credited with brinnging about. Can anyone fill in the blanks? Well, Old England, I wish someone would do the same for me. Strong was important of course in getting going the Global Environmentalism. Global warming was clearly an early favorite of his, and CO2 was in the list of ‘outer limits’ that he told the first meeting of UNEP (1973) he was personally going to investigate. He was involved peripherally up to and including Rio 1992, where the Framework Convention was open for signing. But I am still looking for evidence that he is to ‘blame’ for it all. Maurice Strong seems to be widely blamed but as you say the evidence to support and confirm that he initiated this isn’t readily available. I suspect that, rather than being the creator of CO2=Global Warming, he simply saw it as a prime opportunity and latched onto it in pursuit of his aim of creating an unelected global government. He was very active behind the UN scenes at the highest level until he was caught out with his corporate hand in the UN oil for aid money and fled to China. I believe that Strong was responsible for bringing many activist organisations to the Rio conference, turning what was supposed to initially be a scientific conference into a green-organised event with a specific political purpose. Quickly re-read “The Real Global Warming Disaster” by Christopher Booker, which is an excellent summary of how global cooling became global warming and how Maurice Strong, along with many others, played an important part in this. Strong started out in NY UN security in the 1960s then moved to the Canadian govt energy. In 1971 he chaired a UN environmental meeting. Returned in 1983 back to the UN for more environmental involvement, then organised the signing of the Montreal Protocol in 1987. The Rio “Earth Summit” was his main “achievement”, which he chaired and invited 2400 activists to the conference. In part the 1973 book “Only One Earth” is said to have been very influential in kicking off the global warming scare. I haven’t read it, and I don’t know of a copy on the Internet, but if you really care you can buy a copy pretty cheaply. This sequence leaves out a possibly even more substantial government report, which was the November 1965 report from the President’s Science Advisory Committee described at WUWT here. It set out the complete case for concern about the warming effects of CO2. It’s true that this doesn’t get much of a mention in the ad hoc Panel on the present interglacial, but it never went away, and clearly remained influential with the WMO. ‘the complete case,’ nick? So the ‘science was settled’ even then? What was the estimate for CS in 1965? As the article describes, some geologists were able to get Nixon admin attention to a letter than was out of line with the thinking of most atmospheric scientists, and had the paradoxical effect of creating a lot of climate research funding and infrastructure, which then went to more mainstream concerns. Nick, I am still waiting for the CS numbers they determined in 1965. Surely you must know! CS numbers. You can look it up as well as I can. The fact is that an important report based on the GHE came to the government in the middle of the period concerned. Well then nicky, you either don’t know, or they didn’t exist, or they fell more in line with the two-score papers which show CS to be at or below the IPCCs’ lowest estimates. As you have been repeatedly shown, the scientific consensus in the 1970s was that the effect of CO2 was minor to trivial compared to aerosols. Callendar’s 1938 hypothesis of (beneficial) man-made global warming was considered falsified by 30 to 40 years of global cooling despite rising CO2. The concern that increasing CO2 would lead to global warming was a theoretical one. Temperatures vary – cooling periods happen. The question at issue was what would happen in the future, not the past. The past is a guide to the future. All past predictions of man-made global warming have been shown false, to include Arrhenius, Callendar and the so-called Pause. The same will happen again in future. And even should next time be different, warming is a good thing, and more CO2 in the air beneficial for plants and the other living things which rely upon them, such as fungi and animals. Arrhenius and Callendar were right about that part. The history of human civilization demonstrates very clearly that warmer was better, far better. Ditto for the paleo record of temps being only positive for higher temps. Imagine the amount of life and habitat that was wiped out forever when the Greenland and Antarctic ice sheets began to accumulate. Ditto for the living creatures and habitat stamped out by the transients ice sheets that come back when each interglacial ends. These are changes that destroy all life over large fractions of the entire global land surface. 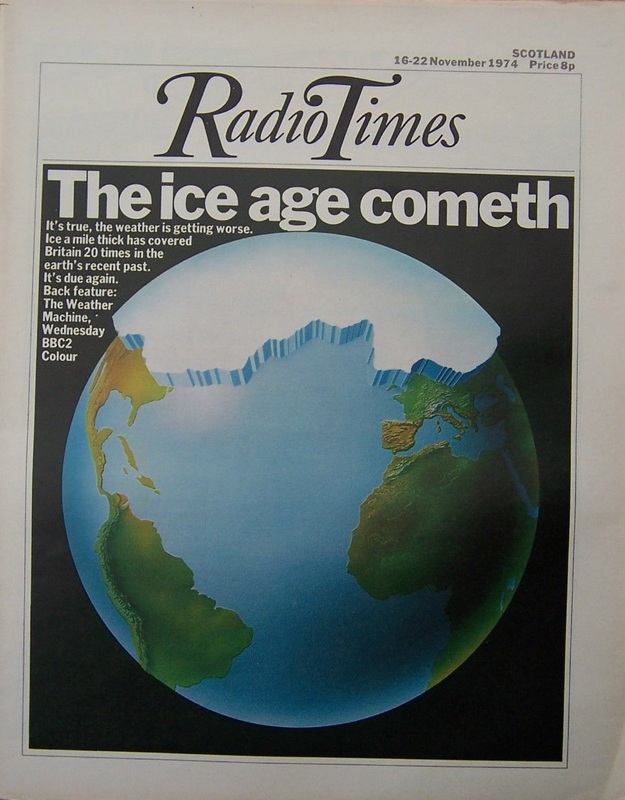 There were no real Time covers on global cooling. I wasn’t referring to Times at that point. Try to keep up. So what were you referring to? You can always count on Nick completely missing the point. You mean the Time Magazine cover, not the Times as in NYT. Real. But not about global cooling. I don’t know the one on the left, or when it dates from, but the picture of an Ayatollah suggests 1979 or later. The middle one is about the oil crisis of 1973, which set in just at start of US winter. And the right was just a descriptive story of some cold US winter months in 1976/77. So this is the weather we aspire to once we have removed all that pesky CO2 from atmosphere. I am looking forward to the grant allocations that actually study for potential benefits of a warmer world, rather than just trying to find fault with it. Perhaps we may be better off? Who knows because no one has bothered to look at the upside. Nick, regarding the Time covers: Your objections only re-enforce my case. The cooling scare was important in the USA in the way it was link to 1.) ‘the energy crisis’ triggered by the oil crisis and 2.) severe winters. The 1977 winter was particularly important because it brought with it Jimmy Carter who soon declared a national emergence and then after the snow had finally melted announced in an address to the nation that ‘the energy crisis’ was ‘the moral equivalent of war’. The next year the National Climate Act passed which brought in the climate bureaucratic infrastructure. Then the peak in 1979 with the oil price x4 of x4 due to the Iranian Revolution. Then, suddenly everything change. Carter was gone, the energy crisis was gone, the climate turned and Hansen got his first NYT front page showing that globally the cooling wasn’t as bad as we imagined. Onto the stage (already set) stepped the warmers. I never subscribed to Time. However, I’ve subscribed to Science News since about 1969. I remember this cover. It is an interesting story. The discussion between the cooling effect of pollution and the warming effect of CO₂ was ongoing in the 60s-80s. When the data supported the cooling, some scientists extrapolated all the way to a new ice age and got the media attention. When the data supported the warming, some scientists extrapolated all the way to a warm catastrophe and got the media attention. While both are real, exaggerating their effect doesn’t take us anywhere. Meanwhile the real main cause for the changes, cyclical natural variability within natural centennial to millennial trends, goes unnoticed and little studied. After all nobody gets any prize for supporting that a figured problem that moves around trillions of dollars actually has a trivial natural explanation. The world needs problems to solve, and if they are fake problems, so much the better. You can always count on solving fake problems, after enough money has been raised. Well now, that is just about the best definition of the climate issue I’ve ever seen! As a minor player in Australian mining, I recall that in the 1970s there was awareness that a lot of coal was going to be mined and it would add to CO2 going into the air. So industry heads accepted a responsibility to keep current with CO2 production to determine if it could harm and if so how to reduce the amount. Nuclear was widely seen as inevitable and a response (my employer company had discovered the important Ranger uranium deposits 1969). There was industry talk about bringing Gro Harlem Brundtland here after she gained prominence around 1983, and likewise Maurice Strong. The former was seen as more genuine for fixing CO2 pollution threats, the latter as a political carpetbagger. Rio in 1992 was seen as green opportunism because a lot of money had appeared before there was hard evidence of a fix for CO2 being needed and plenty of Rio people were making up problems that needed money. Warming or cooling, who cared at Rio when many aspiring scientist youngsters found that catastrophe could be synthesised? Maurice Strong knows how. It is still the case that CO2 problems are hypotheses and not yet accepted theories. The general feeling before I left mining in mid 1990s was that the industry was prepared to fund remediation in good faith once the problem or problems were clearly defined. Since then, they are still not understood but insidious educational, political, advertising etc techniques from special interest groups has created an impression of huge problems and it is easy for incoming industry managers to get swayed when they have not looked deep enough into the hard science. While both the cooling and warming, in terms of temperature “trends” may have been real, the supposed causes (pollution and CO2) were and are pure speculation. Man’s “contribution” at the end of the day is not something even measurable (with the exception of localized effects generally attributable to land use changes), but provides convenient fodder for Eco-Fascism. It’s what the evidence shows. There is evidence for global ice ages, but there is no evidence for a runaway greenhouse effect (CAGW) in the historical record, even when CO2 levels were much higher than today, and much higher than humans could make it if they burned all the fossil fuels on the planet. I know you know this, but thought the distinction should be made for those who don’t. I obtained copies a few years ago of the letters and committe reports surrounding the setting up of the Federal Sub-Committee on Climate Change in 1974. There is nothing hugely revealing, but they offer a good historical perspective. Just read the Brown University letter. Apparently, global cooling was going to bring the exact same extreme weather events as modern global warming. This puzzles me. It has been shown that global warming causes everything so, I came to the logical conclusion that global cooling would cause nothing. A giant planetary void if you will. Like “The Nothing” from the Neverending Story. If guilt-tripping is your thing, then everything that happens can be blamed on someone, and a Neo-Prohibition movement can arise to ban that awful trend. Presto! Big shots can fly around the world and pontificate, while the little people have to grovel and tug their forelocks. Regardless of the problem, the solutions are all the same: give us all control. Yes, I thought that was the proffered hypothesis. Those bad humans were burning fossil fuels, and dirty aerosols were blocking the sun, cooling the earth. And therefore…. wait for it…. Humans had to stop burning coal and oil as fast as possible to avoid global catastrophe! Our current, warm, congenial Holocene interglacial, although cooler than the Eemian, has been the enabler of mankind’s civilisation for the last 10,000 years, spanning from mankind’s earliest farming to recent technology. Viewing the current Holocene interglacial on a century by century and on a millennial basis is realistic. But it seems that, driven by the need to continually support the Catastrophic Anthropogenic Global Warming thesis / religion Climate scientists and Climate alarmists examine the temperature record at too fine a scale, weather event by weather event, month by month, or year by year. The ice core record from Greenland for its first 7-8000 years, the early Holocene, shows, virtually flat temperatures, an average drop of only ~0.007 °C per millennium, including its high point known as the “climate optimum”. But the more recent Holocene, since a “tipping point” at around 1000BC, 3000 years ago, has seen temperature fall at about 20 times that earlier rate at about 0.14 °C per millennium . As the Holocene epoch is already about 11,000 years old, the reversion to a true ice age is becoming overdue. That reversion to Ice Age conditions will be the real climate catastrophe. 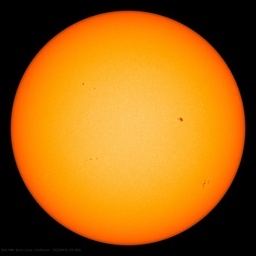 With the present reducing Solar activity, significantly reduced temperatures, at least to the level of another Little Ice Age are predicted quite soon, later in this century. I agree with everything you wrote Ed, but I think the time scales need to be measured in centuries, if not a millennium. As you note, each successive millennial warming period has had lower highs since the Holocene Optimum. Our most recent warming spell has only been 35-40 years long, since the late 1970’s. Now it is hypothesized that we will now enter a cooling phase for 35-40 years, with the onset of a quieter SC 25, and a reversal of the PDO and AMO. We may indeed experience many more of these natural variability downward temperature cycles, but if the majority of all previous interglacials are any indication, we are heading in the direction of the end of the present interglacial at some point in the future. But that in the long run, probably has much more to do with the natural Milankovitch cycles. And then a final Hammer, like a major Stratovolcano to set the whole thing up as Albedo then takes over. But probably another Little Ice Age first, perhaps with a chaos event like vulcanism in the next few decades as we dip into declining temperature trends. The odds are equal for a chaos event like vulcanism during an equally cool period, as they are for a warming period. Perhaps more so for a cooling trend, if you can count on Murphy’s Law for anything. Perhaps a Mount Agung stratovolcano eruption soon will be an early warning of what natural variability is all about and how any human caused warming we may have actually added as the human race will be evidence that any warming is really just an insurance policy on any truly catastrophic cooling period, as all major cooling periods are. Once warming had become a discussion issue, all sorts of people jumped on the bandwagon. Lots of activists saw this as their chance for world organisation along their favoured lines. One name not mentioned above is Margaret Thatcher, the PM of the UK, who was in a major battle with the UK coal miners at the time. Thatcher’s motive was to haul the unions up short, coal specifically. Next time there is an extended cooling period the climate doomsters will be a lot more organized. They’ll just switch their message from CAGW to CAGC. Unless India and China clean their air, we could have man-made global cooling. Will global warming believers then thank those nations for burning so much dirty coal? I enjoy reading the comments as much as I enjoy reading the article. Actually quite a few so-called scientists switched from hyping global cooling to warming, to include “nuclear winter” alarmist Stephen Schneider. And the then-young Arctic researcher featured in the TV documentary displayed at the top of this post. Nor does the article mention the CIA report on the dangers of global cooling, based upon the consensus of its science advisors. Gabro, I would love to know the others. As far as I can see Schneider is the exception that proves the rule as they say, which was that it was actually about competing groups of scientists and to some extent competing disciplines. The cooler geologists never came on side with the warmers. Reid Bryson stuck to his guns on natural+human cooling until he died. Even among those meteorologists warning of LIA return, it’s hard to find any who became warming alarmists…Hermann Flohn perhaps? Swedish scientist Bert Bolin, the first chairman of IPCC, also participated in a BBC documentary “The Weather Machine”, which discussed the human impacts on weather and focused on global cooling. Bolin later was heavily involved in setting up the political machinery for IPCC and climate change conferences. 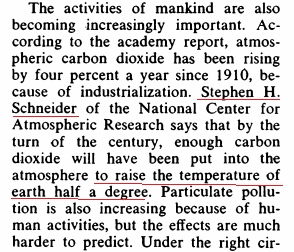 In 1971 Schneider wrote a paper in Science, saying that human emissions would cause disastrous global cooling. This paper included calculations from James Hansen. So you might also say that Hansen was also involved in the global cooling scare. Future is scary. The point is, is creating some almighty global political power, a way to deal with it? History tell us otherwise, but it also tell us we are in no shortage of would-be global leader, and supporters of those “for the greater good”. The NOVA episode is a good example of how a scare gets promoted. If you listen from 7 minutes to 9 minutes, the terrible, driving wind is quite impressive. It really hammers home the “fact” of global cooling. But listen again: it is the same wind through several cuts to different scenes. At that time, synthesizers were big and expensive. But nearly all major TV production studios had access. Nearly any studio synth would generate white noise. You then apply a “filter” up and down, cutting out higher frequencies, then adding them back in, and you get a “wind” effect. Very basic. Any one of you can go into a musical instrument shop, ask to play with a synth that has white noise generator, and a “filter” (filters can be done in many ways but the most common is the type you need), and in a moment be generating your own arctic blast. It is that simple. So, the arctic wind is fake in that episode. Constructed specifically for dramatic effect. Also, Nimoy says, at 6:07: “Our planet is getting crowded.” Sure. Common knowledge. Except to those very few of us who have had the quite rare experience of – get this – flying over the countryside, and viewing mile after mile of undeveloped and or underfarmed land. Two, three, four, five hours of this. With the occasional town or city to break up the monotony. –Somewhere along the way in the current Global Warming Scam, someone pointed out that the “consensus” was all-in on Global Cooling in the 1970s. The Global Warming Scam folks responded by saying, “oh, that was just a couple ill-informed people; we all did not buy into that.” Now, history shows that was a constructed lie: the global cooling scare was vast. RAND had an analyst do several reports on this: google “J. O. Fletcher” and “RAND” and “climate.” His pubs come up on Amazon, but none available. A few years back, I ordered one from RAND just to see it for myself in my own hands. These existed. RAND will still sell a copy. That wind sound appeared on many doom-mongering TV documentaries in my youth, such as about nuclear war, biological weapons and the ice-age scare. Despite the AGW hype, today seems much less fearful, not getting a mobile phone signal is a major concern. Don’t know about the coming of a ice age. But the USA looks set to have a mini return to the LIA over the next two weeks. Over this time expect to see large amounts of snowfall over the eastern states, raw arctic winds blowing down across the mid west which at times will be extending as far south as the Texas coast. Plus a real chance of some record breaking on snow amounts and cold temps. The only difference between now and the LIA is that these winters were turning up more often. To understand climate you need to understand weather. I think the frequency of Winter has remained fairly constant at one per year. Two per year Menicholas. One is from Dec-Mar in the northern hemisphere, and the second is from Jun-Sep in the southern. When weather patterning turns up during the winter. Once a year will be quite enough. And yet there are still warmists who declare that the cooling scare of the 70’s never happened. “Geometric reversal” should read, “geomagnetic reversal,” although the idea that our universe switches geometries is an intriguing one. Amazing that with all this technology we have barely improved our weather forecast skills in the last 40 years, more than 5-7days out and it’s all guesstimation. And yet based on similar technology, there is such unbound enthusiasm for saying we can predict the climate for decades or centuries even. 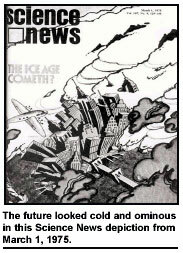 Do the current batch of climate soothsayers accurately foretell ‘Beware the Ides of Climate Change’, or are they no better than the 1980s ju-ju chanters of global cooling? However, we must take note that this time, the climate soothsayers have political and financial traction — will they try to recklessly railroad nations into the sidings, leaving the West with very sick economies and dark inhospitable futures, or take the more measured scientific and conservative response? Politics, power and money, and the power-brokers are now in this mix, corroding these purely scientific endeavors. Can each of these soothsayers be trusted with their data adjustments and hidden methods? Will power, money and fame, and the machinations of the power-brokers distort any of them from a truly scientific approach to the task? As these ‘climate change™’ outcomes now determines so much of the future trajectory socially and economically for many nations, should it not all be made open and universally available? These are the supposedly the days of openness, of open systems, of open technology, why not open climate models, with data and methods available for all? In the US, could President Trump not make it so, embarrassing all others to follow? Or is that a heresy too far? How’s that idea with you Donald? Shouldn’t we just trust our scientific establishments to do just science? — or maybe we need better structures to prevent them from being tempted to go and play in the political mud swamp, and be sucked under by the quagmire of money and power-plays. Maybe a lot more openness is needed. Today’s 5 day forecasts are about as accurate as 3 day forecasts were 40 years ago. Given the scope of the problem, that’s not bad. 5 day forecasts aren’t really accurate. Watch them from day to day and see how the forecasts change. By that 5th day, the forecast bears little resemblance to what they said it would be 4 days earlier. The actual cooling of the 60’s and 70’s actually provides a cherry-picked data warming start start point to blame human CO2. All the climate scammers had to do was suppress the 30’s-40’s warming with infilling and homogenization adjustments. One just needs to recall, “Why the blip?” in the Climate Gate emails how the 70’s cooling allowed the subsequent data manipulators to run steam with the current CAGW scam. Also – satellites largely came online in that 1970s era, following Sputnik. Sputnik gave rise to satellite-era data, and making everything pre-1970 as “pre-history” because it was not satellite data. I presume you meant a rocky “descent”, as opposed to a rocky “decent”. Such a typo/misprint at the outset doesn’t auger well for the rest. I am a confirmed sceptic, but do we need to up our game, just a bit. You dig too deeply when you auger into the article to find a nitpicky typo. That does not augur well for your ability at reading comprehension. This is also true for geophysicists who predict imminent earth quakes. And you must remember the fact that Dr Linzen has brought up before, that prior to just recently, climatology departments didn’t exactly attract the brightest students. Even in 70s and 80s, it was more political than scientific, that’s evident in this article. I have two people to list in response to the above article that few scientists flipped from global cooling to global warming: John Holdren and Stephan Schneider… two very notables. Whenever I bring this up and get the usual and predictable warmist “there was no real science being done” which leads to “show me the peer review, not magazines”, which leads to “whatever, there is much more science behind warming”, I just tell them there wasn’t much peer review concerning trans and gender 40 years ago, either. Certainly much more today. Whatever that means. 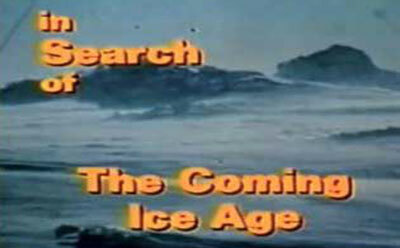 C’mon guys, I’m now “middle aged” and the global cooling scare of the 1970’s is still very clear in my memory. It will remain in living memory for another 50 years. You should be happy about that. Michael, I did worried about that that was rather glib. Actually, what I meant was the ‘living memory’ of those who participated, many of whom were mid- to late-career at the time. For example, we can no longer ask J Murray Mitchell (d. 1990) for his view of the cooling scare and the transition to the warming scare, nor can we ask Hubert Lamb (1997), Bert Bolin (2007), Reid Bryson (2008), Steven Schneider (2010), George Kukla (2014) Robert White (2015), Maurice Strong (2015), nor Mustafa Tolba, (2016). The Global Cooling , Ice Age scare came right after the Cold War Scare …Ducking under tables, etc….I remember both, clearly..
That was scare on a shoestring budget. Gone are the days. Now we have the scare industrial complex on a multinational scale. It would rank in the top 100 economies on the planet and have the highest average income and largest carbon travel footprint of any nation. The author should do a little more research. Decades ago, Maurice Strong and the UN attempted to devise the most cataclysmic disaster that could befall mankind. They considered several possibilities including, believe it or not, threats from extraterrestrials, in an attempt to get Americans and the world to give up sovereignty and acquiesce to more taxes and world governance. They finally decided that impending catastrophic global warming was the most viable lie. Thus began the biggest fraud in the history of mankind. Yeah, we know. Tell us something new. From the you’ve got to be effing kidding me department. First, I apologize to my readers for the headline. Read on and I think you’ll see it is justified. The headline is paraphrased from the article and the paper to give you the flavor. 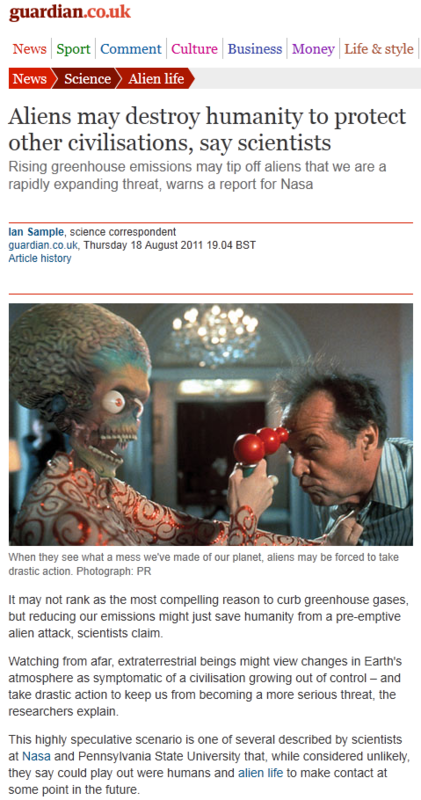 I have reproduced the passage used by the Guardian and provided a link to the full paper below. And soon after the scare, the cultural Marxists realized “climate change” was the perfect scare-mongering and rent-seeking tool, even better than a zombie-apocalypse. The end of my cooling concerns was two-fold. 1) It was proposed that a trigger for a glaciation would simply be that high latitude snow wouldn’t melt. The next year I flew across the country in the early spring and saw millions of conifers stick out above the snow. Conifers are very dark on Kodachrome film – I figured it would take a lot, lot, more snow to cover the trees’ and their low albedo surface. 2) The first “Keeling curve” of CO2 came out in the latish 1970s. It showed absolutely gorgeous, low-noise data of CO2 concentrations at Mauna Loa. You could see the seasons! You could see the increase from year to year! My sister was a grad student and located at the Marine Biological Lab in Woods Hole. The Keeling paper became a major event, with students adding at the end of their papers just to connect to it. One even used it upside down. (No, not Michael Mann.) There was talk about people setting it to music. I concluded cooling was over, and CO2 was where it was at. Thereafter I was quick to defend nuclear power with “at least it doesn’t release CO2!” Today, CO2 doesn’t seem all that bad any more, and the climate has paused for a bit. I’m not certain which way it will head next. The next decade or so may be very interesting. Given a choice I have always thought humans have a much better chance of surviving global warming than another ice age. Food alone would condemn most on earth to a rapid death in an a new ice age.